Posted on Sun, Dec 25, 2011 : 5:59 a.m.
Drew Dileo scores a touchdown against Eastern Michigan. Dileo, a sophomore wide receiver, is a Louisiana native and played in two high school state finals at the Superdome. 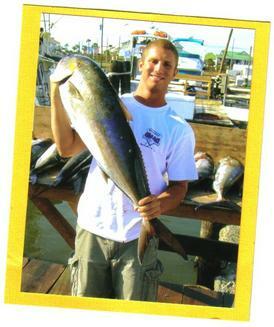 Drew Dileo went fishing with a buddy on a trip back home in August. They were trolling for bass deep in a backwoods Louisiana swamp, where the late summer air breathes heavy with humidity. What they hooked, though, was an alligator. Dileo suggested to his friend, Gabe Woods, an infielder on the Ole Miss baseball team, that they try to reel it in. "You get it in the boat," Gabe replied. "I’m going to grab it by its mouth and put a tape around it." Dileo shakes his head telling the story, acknowledging the risk inherent to a pair of Division I athletes sticking their hands near a gator's mouth. "I’m reeling it into the boat, it opens up its mouth and shows its teeth, and we’re just like, ‘We’re changing the plan," Dileo says, laughing. "There's no way I’m not putting my hands down there." Dileo is from Greenwell Springs, La., a suburb of Baton Rouge. Or, as he calls it: "A whole other world." He was sitting in a Charlotte, N.C., airport three Sundays ago, on his way home from that world, as his Michigan football teammates gathered at Schembechler Hall to learn of their bowl fate. And then he got a phone call from running backs coach Fred Jackson. "I’m going to tell you somethin’ no one else knows," Jackson said. "Drew, I just want to tell you we're headed home. We're going to play in the Sugar Bowl." When Jackson learned the Wolverines would play Virginia Tech on Jan. 3 in nearby New Orleans (8:30 p.m., ESPN), the first person he called wasn't his own son, Jeremy, a receiver on the team. It was the "other little son of mine," Dileo. After all, it was Jackson, who grew up 5 miles from Dileo's mother in Baton Rouge, who plucked the receiver out of obscurity. Now, they're both headed home to Louisiana to play in one of their sport's biggest games. Dileo is a sophomore receiver for the Wolverines, but his journey to Ann Arbor at one time seemed unlikely and tortuous. Drew Dileo was an elite high school baseball player. 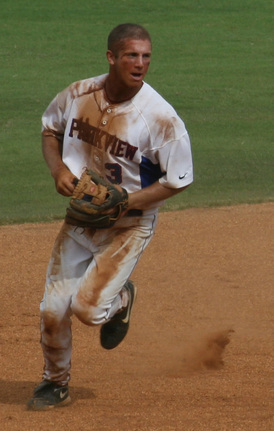 He hails from Parkview Baptist High School in Baton Rouge, about 75 miles from New Orleans. He was a prolific receiver and return man, but played at a low level of Louisiana high school football and was listed at 5-foot-9, 170 pounds, which scared off most BCS schools and all of the major recruiting experts. He wasn't even ranked by Scout or Rivals. Dileo was, though, an elite baseball prospect, drawing interest as a sophomore and junior from Division I powers such as LSU and Southern Miss. And, whereas he was criticized for his size in football, he was the ideal build to play second base. Dileo went 3-for-4 in the state championship game as a junior. He pitched the final inning, picking up the win and securing Parkview Baptist's second consecutive state title. But he never again stepped foot on a diamond. Football came calling — and so did Jackson. Michigan's longtime running backs coach has recruited his native Louisiana for two decades. On a trip to the area in search of receivers and defensive backs, Jackson ran into Kenny Guillot, a legendary coach in the area. "I got to Parkview Baptist, and they said, ‘We’ve got this guy who’s not that tall, not this, not that, and I said, 'Let me see the film,'" Jackson said. "He doesn’t have the physical makeup of an excellent player, but he is, and when you need a play in the game and you put the ball out there around him, he’s going to make the play," Jackson said. He knew he had to have Dileo. What Jackson didn't know, though, was Dileo's dream school was Michigan. He grew up in the heart of SEC country and just down the road from LSU, but idolized Charles Woodson, Mike Hart and Desmond Howard. His bedroom's curtains and pillows were plastered in maize and blue. He asked for a Michigan comforter for Christmas when he was 8. "It’s probably still in the attic somewhere,” Dileo says, laughing. "I loved that thing." So, naturally, Michigan was at the top of Dileo's wish list, even though it seemed to be a pipe dream. "You wouldn’t believe the people that, because of his size, just thought baseball would be a better option for him," said Mike Dileo, Drew's father. "They just couldn't believe he'd turn down baseball to play football. It didn't make any sense to them." Mike can still recall in artful detail the night the scholarship offer arrived in the mail. It was a week night, and it was late because Drew had played a baseball game out of town. He had struck out three times, the only time Mike can remember that happening. Mike called Drew, who still was driving home from the game. "Man, kind of a rough night, huh?" Mike started. "Yeah, I’m pretty upset," Drew replied. "Well, this might cheer you up," Mike said. "You just got a letter from the University of Michigan, and they offered you a scholarship." Drew fell silent. Then, "went bonkers." He was headed to Michigan. Dileo didn't play much last year, recording only one catch in one game at receiver and serving stints as the holder and kick returner. This year, though, Dileo has turned himself into a sure-handed option in offensive coordinator Al Borges' spread-West Coast system. 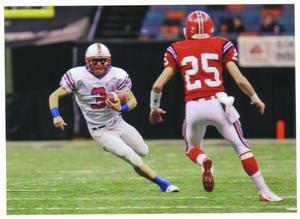 Drew Dileo, shown as a senior, played in two high school state football championships in the Superdome. He has nine catches, two of which went for touchdowns and three others that earned first downs. He caught all but four balls that were thrown in his direction and impressed Borges as a guy who "just gets it done." Borges compared him to David Eckstein, a former Major League shortstop whose production belied his slight physique. “I’m a (San Francisco) Giants fan, so I hate David Eckstein, but he (was) such a good baseball player," Borges said. "Drew is that kind of football player. He’s going to get a lot of hits. He’s probably not going to hit many over the fence, but he’s going to get a lot of hits. "He’s a guy that, in so many ways, you can count on him to do exactly what you coach him to do. Believe me, from my perspective and from everybody who’s involved with coaching Drew, we appreciate that." Dileo also has left a mark on special teams, where, as the holder, he's twice carried the ball on fake field-goal attempts. He picked up a first down both times, and his dive against Nebraska came within inches of the goal line. After the game, he had a text waiting for him from Michigan hockey player Chris Brown: "If only you were 5-10." It was a playful jab, but cuts to the heart of what Dileo's been fighting against. Now, he'll be featured in the Sugar Bowl, only the second time in Michigan's long history it has played in the bowl, and the first time since 1984 -- eight years before Dileo was born. So, when Dileo was playing at the Superdome in the state title game as a senior — his second time playing there, after earning MVP honors in the finals as a sophomore — he had no expectation he'd return. "I still remember being in the Superdome, looking up and seeing the Allstate Sugar Bowl banner while playing in the high school state championship, and now I’m playing in the Sugar Bowl," Dileo said. "It’s kind of like a dream come true." What makes Drew Dileo happy? Fishing, hunting, cowboy boots and quality pickup trucks. As the only player from Louisiana on the roster, Dileo has begun warning his teammates of the cultural change between the Deep South and Midwest. It isn't hard to discern Dileo's Southern roots. He wears cowboy boots around campus and the football facilities, and he speaks with a soft drawl. He insists, "Y'all is a word. People just have a lot better accent than Northerners." Teammates make fun of him for how big his Nissan Titan truck is — yet he laments it's not big enough for him. "Where I’m from, every other car I see is a Ford F-150 with big mud tires, and lifted," he says. "That's what I want." He wants to drive that truck while bumping country music. He still doesn't like the cold. The biggest difference between North and South, though? "I don’t think I’ll ever be adjusted," he said. "I’m used to eating crawfish etouffee, seafood gumbo, jambalaya. Up here, the food is just so bland." Dileo is getting some of that home cooking this weekend. He flew home Friday and celebrated Christmas in true Louisiana fashion. His mother's family is Cajun and served seafood gumbo. His father's side is Italian and makes spaghetti. And, in Louisiana tradition, there was a Christmas Eve bonfire. Dileo will make the short drive to New Orleans with his father on Wednesday to rejoin the team. He has received dozens of requests for the six tickets he's allotted through the athletic department, although he expected to receive some unused tickets from teammates. The Dileos expect almost 40 friends and family to attend the Sugar Bowl, many of whom have never seen him play college ball. Drew said he was particularly eager to play in front of his grandparents, only one of whom has seen him play at Michigan. He won't need to grab tickets for his father, though. Mike won two tickets to the Sugar Bowl earlier this year in a golf outing, long before Michigan was selected. Dileo's drawn a lot of nicknames through the years. "The Real Dileo" has stuck the most around campus. Teammate Kevin Koger calls him "The White Receiver," instead of the wide receiver, which is his favorite. Back home, though, he had another nickname growing up. Wed, Dec 28, 2011 : 10:33 a.m. Cool story! If Drew and his buddy had reeled that gator in then UM would have reeled in a Gator bowl bid instead of the Sugar Bowl? Thank you Drew ;) Will we watch Drew haul in the winning TD from Drew in the Super Bowl a few years down the road? (Brees to Dileo) Meanwhile, we will enjoy watching the rest of Dileo's career at UM. GEAUX BLUE! Tue, Dec 27, 2011 : 2:59 a.m.
great read kyle. . . being ranked by scout and rivals doesen't always count that much. this kid play's with a lot of heart and passion for MICHIGAN football and that's the only thing that count's! GO BLUE!!!!!!!!!!! Mon, Dec 26, 2011 : 8:59 p.m.
Great story as most have said! Mon, Dec 26, 2011 : 4:58 p.m.
Great Read and perfect for the holidays. Thank you :-) Go Blue! Mon, Dec 26, 2011 : 3:58 p.m.
Kyle: I've loved your writing all year (and hopefully into the future...). This was such a fun article to read. This guy is really funny, and I have noticed him on the field even though I didn't know his name at the beginning of the year. I hope he continues to shine. Mon, Dec 26, 2011 : 2:43 p.m.
AND THANK YOU MR. MIKE DILEO FOR THE PICTURES AND TRUSTING MICHIGAN WITH YOUR SON! Mon, Dec 26, 2011 : 2:37 p.m.
That's great information, each of these young men have unique stories that we rarely get to read or hear about. It's quite a leap of faith to leave Louisiana for the Great Lakes with no guarantee of playing or having a role. Like a long snapper, if you never hear his name as the holder that means he's doing a perfect job. I think he's got great potential to sneak in for some big plays using those sure infielder's hands. Mon, Dec 26, 2011 : 5:28 a.m.
Merry Christmas Kyle Okay, what the hell is crawfish etouffee and will it replace your blueberry muffins? Mon, Dec 26, 2011 : 8:08 p.m.
Mick, you should know better than to *ever* question my allegiance to blueberry muffins! Mon, Dec 26, 2011 : 2:42 p.m.
just the sight of live crawfish makes me squeamish (how do you spell that?). Then look at them peeking out over the top of a pot of boiling, steaming, roiling water with those black eyes. Geesh. It's better not even to know what's in your gumbo. Mon, Dec 26, 2011 : 4:43 a.m.
Mon, Dec 26, 2011 : 2:39 p.m.
Dang, it takes me 4 times as long to poke something on my iPad, 1/4 of the letters don't seem to show up and I have to go back and insert them. Mon, Dec 26, 2011 : 4:45 a.m.
My iPad crapped out on me ... But I think You get my point in my post even with the typos ... Go Blue! Mon, Dec 26, 2011 : 12:40 a.m.
Really Great Article Kyle. You are one of the few reasons I keep coming back to this site. Sun, Dec 25, 2011 : 10:50 p.m.
Gotta love a good underdog tale... but one has to wonder when we can stop talking about Michigan having a short group of wideouts. We've got two 6+ footers coming in... thank goodness. Sun, Dec 25, 2011 : 9:53 p.m.
Sun, Dec 25, 2011 : 7:54 p.m.
Great to see the kid do well. It's funny how many &quot;michigan fans&quot; were blasting the kid when he accepted the offer, as if they somehow know more than the coaches. He's got something that you can't measure: heart. Good luck kid, you've made the university proud, you are well on your way to becoming one of the great Michigan Men. Sun, Dec 25, 2011 : 6:35 p.m.
YOU guessed it right!!! Drew Dileo........Heisman!! 2012,2013 AND 2014!! Hope everyone has a MEANERY Christmas and Hap Happy HEISMAN New Year!! MEEEEEEEEEANchigan has returned from a black hole! They will roll in New Orleans with Drew Dileo!!! Your posts are always amusing. Sun, Dec 25, 2011 : 5:18 p.m. Fantastic article- has it all. should win a sports Pulitzer. I was always wondering who is this kid named Dileo who makes the timely catches.. Now I really know. A kid from Baton Rogue who grew up wanting to be a Wolverines. ; now that's a Michigan man! Sun, Dec 25, 2011 : 4:12 p.m.
Sun, Dec 25, 2011 : 4:02 p.m.
Don't we have other wide receivers who are white? He can't be the only White Receiver. The other guys probably just don't play because of their limitations. Sun, Dec 25, 2011 : 3:05 p.m. I have to say this is perhaps Kyle's best article since he arrived here. This is original, and he wrote it with passion. GO Blue! Sun, Dec 25, 2011 : 2:38 p.m.
i've been watching M football for over 50 years, and i've had many favorite players. everyone loves denard----impossible not to. but this year i perk up everytime martavious odoms or drew comes into the game. martavious has had the quickest four year career in M history. drew was steady last year and this year began to get more playing time. he is surehanded (maybe the 2nd baseman in him) and steady. i really hope that he enjoys his stay in A2-----with or without the etouffee. thanks, kyle. Sun, Dec 25, 2011 : 2:35 p.m.
Sun, Dec 25, 2011 : 12:36 p.m.
Sun, Dec 25, 2011 : 12:17 p.m.
An uplifting Christmas morning read..Geaux Blue!!!! !